Toys"R"Us has taken a good long look at the increasingly crowded Android tablet market and decided it wants a minuscule sliver too. 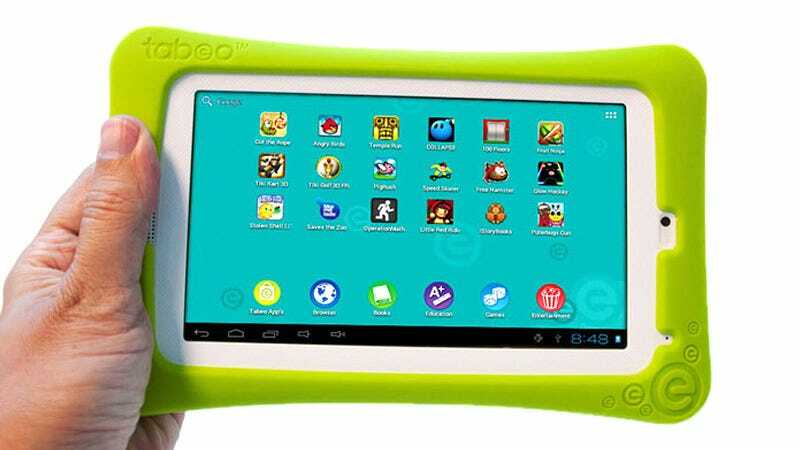 So starting October 1st, every child's favorite store will start selling a seven-inch, $150 Android device called the Tabeo (Tabby-oh? Tabe-e-oh?) targeted at younger users. But what makes the tablet kid-friendly? Besides a custom UI that keeps Android 4.0 Ice Cream Sandwich stripped to the bare necessities, the Tabeo comes pre-installed with 50 different apps that cover everything from games, to educational titles, to ebooks. And its custom app store is promised to offer some 7,000 additional titles, including favorites like Angry Birds and Fruit Ninja. There are also plenty of parental controls in the 1 GHz ARM Cortex A8 processor-powered tablet, including the ability to remotely lock down or limit the device from a browser, for those times when your young'n locks themselves in their room. At the moment Toys"R"Us' online store shows the Tabeo available for pre-order with a ship date of October 1st, but the official press release indicates it won't be hitting brick and mortar store shelves until the 21st. With competitors like the MEEP!, Vinci, and LeapPad already targeting kids, this is certainly a sector that might be over-served already. But who knows, maybe Toys"R"Us has managed to build a $150 Android Tablet that's a lesson in something more than abject frustration.